he story of Hera, Queen of the Gods, and the heroes who won her favor. 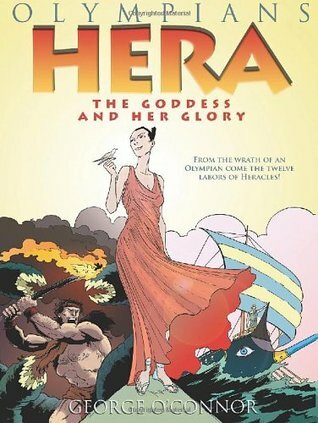 Volume 3 of Olympians, Hera: The Goddess and Her Glory, introduces readers to the Queen of the Gods and Goddesses in the Pantheon. This volume tells the tales of the many heroes who sought and won Hera’s patronage, most notably Hercules. So I was debating on wether to give it 4 or 5 stars only because even though this one is called Hera there seemed to be a lot more of Hercules stories in it. In the end I gave it 5 because I honestly enjoyed all the stories that were told. I’m reading these along with my 8 year old. He was not impressed by Hera but I was. I think it was great to get a kind of different interpretation of her instead of the one I had where she was just a rightfully vengeful wife. I mean most of the things that happened was Zeus’s fault but she married him knowing how he was. I think she kind of had a sense of humor about her I especially liked it in the Io story. I felt bad for Io but how Hera handled it was pretty funny especially while Zeus was trying to talk Hera out of keeping the transformed Io. Then I found it interesting in the Jason and the Argonauts story what Jason said about Hera. How she is actually good for them despite how she seems to be using them. Hercules stories were probably the best part of the book. I loved reading all his adventures and seeing Hera’s part in the background. Loved the ending where Hera gets away to just be Hera because even goddess need time off. Again the end with all the extra information was most welcomed and intriguing to see why the author wrote the Goddess and the demi god as he did. Fun mythological stories. Love the artwork.